Poznan Glowny Station, July 2007. Photo Radomil, Wikimedia Commons. You would have thought that no one could possibly object to a new low-cost rail service between Poznan and Berlin. Similar services already operate between Szczecin and Berlin and have proved very popular. Residents of Wielkopolska province could choose rail over car or bus for their forays into Berlin and lots more Berliners would come to spend their euros in Poznan. In hindsight, it was not such a good idea to get Warsaw involved. Radek Sikorski sent the Governor’s letter round to the Ministry of Infrastructure, the Ministry of Interior Affairs and the Office of Railway Transport to obtain their views. Janusz Englehardt, the Undersecreary of State responsible for rail was quick to respond. It would be illegal for a local authority to subsidize an international train, he opined. So it seems that the residents of Wielkopolska are not going to get their cheap trains to Berlin just yet. VIP Preview at the Warsaw Railway Museum 27 March 2010. Pioneering Warsaw blogger Michael Dembinski, managed to wrangle himself an invitation to the VIP preview of the Dworce Kolejowe Galicji Wschodnej (The railway stations of East Galicia) exhibition at the Warsaw Railway Museum. Click the image above to read his full report on the W-wa Jeziorki blog. The exhibition features the photography of Marta Czerwieniec who, as well as being interested in railway infrastructure, is an expert on geneaology. While tracking her own family history she discovered that her great grandfather, Karol Stronczynski, was a railway engineer. He was a graduate of the Technical Academy in St Petersburg and later went on to design bridges and viaducts on railway lines on Poland’s eastern borders and in Russia. It is greatly encouraging to see that Ferdynand Ruszczyc, the Museum Director, is actually running an event with a railway theme as opposed to holding more fashion shows and beauty competitions! Sosnowiec Maczki Station. Photo ChemiQ. Travel by train from Czestochowa to Krakow and some half hour before your destination you find yourself travelling through a railway landscape that looks like the original track diagram for the Isle of Sodor. Junctions follow each other and branch lines swirl round in huge loops without rhyme or region. Tracks criss-cross each other in quick succession. One track has had train loads of sand tamped under it to prevent it falling down a mine. A massive flyover built a couple of decades ago is already disused. The coup de grâce is Sosnowiec Maczki station, built in an imperial style and on an imperial scale, the station has had its exterior carefully restored and all its windows and doors blocked up! The station is the most important original surviving building in Poland from the Warsaw – Vienna Railway. Construction started in 1839 and lasted 9 years. The station was on the border between the Russian Empire and Austrio-Hungarian Empire and had special rooms for the use of the Tsar and his retinue. After Poland recovered its independence in 1918 the border was moved south and the station lost much of its importance. Nevertheless Sosnowiec developed into an important mining and industrial town and the station continued to serve the transport needs of the local population until relatively recently. Unfortunately, while some 1/4 million people live in the Sosnowiec area, today the station is only served by three train a day in each direction. Satellite view of Sosnowiec Maczki Station and surrounding railways. Ty2-953 running light engine from Chabowka Station to Chabowka Skansen on the occasion of the Chabowka Gala on 29 July 2009. The Friends of Wolsztyn Shed (TPWP) are organising a special train which will tour Wielkopolska on Sunday May 2nd 2010. The route includes the Międzychód – Sieraków and Międzychód – Łowyń lines that have not seen a passenger train for years. The train will consist of a Chabowka based Ty2 or Ty42 hauling class 43A and 102A vintage bogie coaches and a bogie luggage van. The advertised route is: Wolsztyn – Zbąszynek – Międzyrzecz – Wierzbno – Międzychód – Sieraków Wlkp. – Międzychód – Łowyń – Międzychód – Wierzbno – Międzyrzecz – Zbąszynek – Wolsztyn. Sadly, because of high PKP PLK track access charges, the cost of the trip will be 160 PLN (approx. £37) – which is quite high for Polish enthusiasts. The train is running the day after this year’s Wolsztyn Steam Parade and TPWP is extending a cordial invitation to all railway enthusiasts to participate in this trip ‘back in time’. A special English language page about the trip has been hosted on the society’s website. This quite informative, but commits the error of calling Wielkopolska Greater Poland – Ugh! See here why this is wrong! A booking form is also available on line. Wolsztyn – a new beginning? The Wielkopolska provincial governor’s office confirmed today that talks are under way with PKP with a view to both parties setting up a special company to manage Wolsztyn shed. Other local authorities, at district and municipal level would also participate in the project. PKP would contribute rolling stock, buildings and land worth some 5 m zloty and it is hoped that the smaller local authorities between them could raise a similar amount in cash. Wojciech Jankowiak, the Deputy Governor, is adamant that he does not want to create another ‘skansen’ full of dead locomotives. 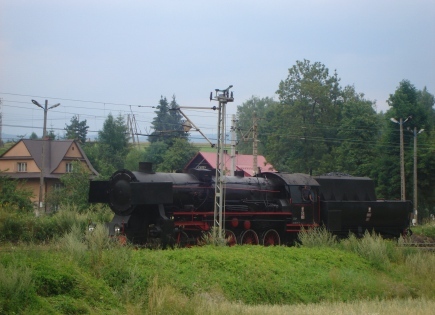 The objective is to future-proof Wolsztyn shed and the trains hauled by its steam locomotives. While the objectives of saving Wolsztyn for posterity are certainly admirable, it is by no means certain that if a deal is concluded the PKP SA main board will meekly sign the agreement. Following the criticisms meted out by the National Audit Offices in the report of its investigation into the PKP group, the board may think again before handing over its assets to another organisation. Nevertheless we live in hope! Tkt-48 151 outside Chestochowa Glowna Station. Now the Czestochowa Railway Museum is the latest victim of PKP SA’s property crackdown. Following the demands for a commercial rent – and follow up eviction notices – issued to TOZK, the railway society running the skansen at Pyslowice; and to the Muzeum Kolejnictwa in Warsaw, the nearest Poland has to a national railway museum; now TPKWW, the Society of Friends of the Warsaw – Vienna Railway, have been told to pay a commercial rent or move on. The museum was operated with due pomp and ceremony on 23 March 2001 in the presence of PKP directors and local dignitaries. All the work has been carried out by volunteers. The prime mover of the project was a retired railwayman, Zdzislaw Urbanski, who died last year. Under his leadership a large collection of small railway exhibits was gathered together and exhibited on the first floor of Czestochowa Stradom station. In addition the Society had two railway locomotives in its custody 2-8-2T, Tkt48-151, displayed outside Chestochowa Glowna Station and 2-6-2, Ol49-20 displayed near the engine shed. The local representative of PKP SA’s property services, Jolanta Michalska, claims that PKP SA – as a limited company – must always charge a commercial rent for its premises. In the short-term she has demanded that the Society remove their exhibits so that the museum location can be properly documented – at a cost to the Society of 20,000 zl. The Society, consisting mostly of retired railway men, has no hope of raising the necessary monies to pay for the ‘documentation’ or of being able to pay a commercial rent thereafter. Ironically the Slask provincial government is about to launch of 2.2 million zloty campaign to promote the area as part of the European industrial heritage trail. But the cash is strictly for ‘soft’ expenses like marketing – it cannot be used to help the museum. It seems only appropriate to give the last word to Fryderyk Katny, the chairman of the TPKWW. After we move out, the vandals and thieves will move in and trash the place. Half the building is empty and the other tenants have already given notice to quit. 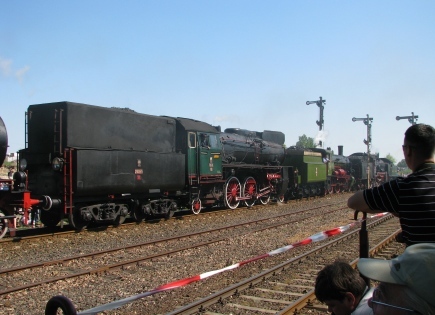 Poland’s new umbrella society for the heritage railway movement, the Polish Federation of Museum, Tourist and Local Railways, held a two day meeting at Zbiersk Cukrownia on the SKPL-operated Kalisz Railway over the weekend. Representatives took part from the Bialosliwa Railway, the Bytom Railway, the Koszalin Railway, the Starachowice – Iłza Railway, the Naleczow Railway Supporters Association, and the various SKPL narrow gauge and standard gauge lines. Among the matters about which the Federation plans to take action are the absurdities in the law which penalise freight-carrying narrow gauge railways with greater tax liabilities than standard gauge lines or the broad gauge LHS line. Also discussed was the Federation’s presentation at the April Fedecrail Conference in Budapest. SKPL acted as host and provided a splendid dinner for all participants and ‘hangers on’. 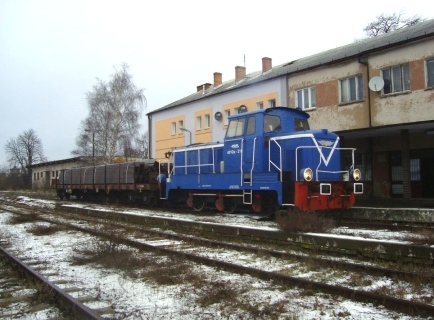 During the informal part of the proceeding there was a discussion about the problems faced with the Bialosliwa Railway Society who – having saved part of the 600 mm gauge Bydgoszcz and Wyrzysk Railways system and restored it to operation – face being evicted by the owner of the line, the Pila District Council. We wish the Federation many successes in their future battles and pledge to do what we can to support their campaigns. On Sunday 7, March the Pesa EMUs ED74-013 and ED74-008 coupled together were tested at up to 160 km/h (100 mph) between Warsaw and Konin. The EMUs stand side by side with a Siemens Eurosprinter-hauled train at Konin Station. Photo PN via infokolej.blog.onet.pl. While the Pesa ED 74 EMUs are shown off by PKP Intercity as the last word in passenger comfort, they are universally hated by frequent travellers and the train crews. Faults include: very uncomfortable seating which is absolute murder for anyone with a bad back, regular failures with the electronically controlled air conditioning and toilets. Particularly galling is the fact that although millions of euros of EU funds were spent on acquiring the EMUs and upgrading the Lodz Widzew to Skierniewice railway where they run – they are throttled back to a maximum of 129 km/h and the 90 minutes that they take to complete the journey from Lodz is no better than achieved by the fastest trains before WW II! Polish ATOC to be formed by PKP PLK! Planning managers working for PKP PLK, Poland’s railway infrastructure company, are working on the idea of forming a Train Operators Council, which would assist the company in making its strategic decisions. Although it is envisaged that the Council will only have an advisory and consultative role – and not take binding decisions – it could become an important interface between the train operators and the infrastructure company. Zbigniew Szafranski, PKP PLK chairman, envisages that the new Council could help his company prioritize and shape investment projects, so that they are more customer focussed. According to him another role for the Council would be to work on the legal relationships between train operators and PKP PLK – the Council could work with the infrastructure manager to propose changes to Acts of Parliament or regulations signed off by the Minister. BTWT applauds the idea wholeheartedly with the proviso that – for such a body to be effective – it should be independent and not the tame creature of PKP PLK. A wagonload of steel from Germany arrives in Srem in December 2009. The Czempin – Srem line is operated by SKPL and is in the process of being taken over by Srem municipality. Further takeovers of branchlines by local authorities are unlikely to receive the support of rail minister, Juliusz Engelhardt. Photo Jacek Stawinski, SKPL. Hopped onto a Tanie Linie Kolejowe (PKP Intercity’s ‘cheap’ brand) train to Warsaw to take part in a conference about the future of Polish rail and in particular Przewozy Rejonalne Poland’s second train operator owned by the 16 provincial governments. Other panel members included Juliusz Engelhardt, the Undersecretary of State responsible for railways at the Ministry of Infrastructure, and Janusz Piechocinski, the Vice-chairman of the Sejm Infrastructure Committee. In the short slot allocated to me I pointed out that the privatisation of BR did not bring about many of the benefits that it was supposed to. Because it was carried out by breaking BR up into over 100 separate companies, it actually increased the cost to the taxpayer of maintaining the railways by a factor of three – and still the UK has the most expensive fares in Europe. Janusz Piechocinski leaves early, but I get a shot at asking the Minister Engelhardt a question. Given the reappraisal of wagonload freight traffic recently evidenced by the creation of the Xrail Alliance. Would the Minister agree that it would be rather strange for a freight to carry right across Europe by rail only to have to complete its last leg in Poland by road? A number of local authorities have taken over their local branchlines in order to keep them operational in the manner of the shortline railroads of the USA. However, during the transition period – before a local authority has been granted the freehold of the railway land and only possess an operating licence, it would appear that Polish law prevents the local authority from applying for EU funds or investing its own monies in the railway. Would the Minister talk to his colleagues in the relevant Ministries in an attempt to resolve this situation. Mr Engelhardt replies that, it is a mistake to think that PKP or the Ministry don’t want to hand over disused branchlines. Rather it is the case that a number of local authorities have announced that they want to take over their local branchlines, because local government elections are looming. They are very naive and have no idea at all of the burden of legal and regulatory obligations which they would acquire if they take over the railway. He has avoided answering my question and I lob in a supplementary. I apologise for my poor Polish, no criticism of the Minister, the Ministry or PKP was intended. My question was about those lines that had already been transferred by PKP SA to local authorities, but where – because property transfer formalities were not complete – the local authorities felt that they were precluded from making any investment in the railway infrastructure. The Minister gives a similar answer to the one he gave before, pouring scorn on the efforts of local authorities to take over their branchlines. His answer does not bode well for Poland’s shortline promoters including my Polish narrow gauge friends and local authority bosses like Jozef Zajkowski struggling to take over the Lapy – Ostroleka railway line from PKP. We are thinking of including Polish special characters in Polish words. Up to now we have been removing special characters from Polish words and replacing them with the nearest equivalent English characters. We were concerned that these characters could appear garbled. However, with modern operating systems this praqctice should no longer be necessary. Please look at the characters in the list below below and let us know if you can see what you should see. ć – a ‘c’ with an acute accent (´) above. ó – a ‘o’ with an acute accent (´) above. Ouch! Thank you to all the readers who pointed out that it was impossible to ‘vote’ for more than one character. I’ll set the poll up again and hopefully this time get the questionnaire right. BTWT is 2 years old! Behind The Water Tower is two years old! By rights we should have been celebrating our birthday on 3 March, but the report of the National Audit Office investigation of the PKP group had just arrived and we thought we should get the translation of the management summary into your hands as soon as possible. The NIK report confirms what we all know Poland’s railway are in a serious mess and matters appear to be getting worse. Most infuriating – large sums of money, that were available from the EU for the modernization and upgrading of Poland’s railway network, have not been spent because PKP has not submitted the correct paperwork. At such a time a publication like BTWT which is entirely independent of vested interests – and has an international readership – can play a useful role. This is a very important period for Poland’s railways – decisions about to be made at national government and provincial government level – will determine the long-term size of the railway network and the extent and quality of the services that operate over it. When BTWT launched, I never dreamed that two nears later the blog would be nudging the 200,000 cumulative hits mark, nor that Tunnel Vision, our daughter blog analysing UK developments and published very occasionally, would have clocked up 11,000 cumulative hits in its own right. I would like to thank all those who help to keep both our blogs on track. Special thanks are due to: fellow bloggers – Mike Dembinski, the Fact Compiler and Phill Davison, who not only allow us to cross post articles, but generously have provided back links; guest authors – Robert Hall, ‘Inzynier’ and Grzegorz Sykut; the photographers who have allowed us to regularly use their pictures – Marek Ciesielski, Tomasz Domzalski, Robert Dylewski, Jerzy Dabrowski, Tilo Rösner, Harald Finster, Andrew Goodwin, Dewi Williams, Phill Davison and the late Alun Evans; all our comment contributors, especially our ‘regulars’ Robert Hall, Geoff Jenkins and Gavin Whitelaw; and last but not least all our sources, with special thanks to ‘podroznik’. Before I close I would like to raise a glass of Zubrowka and drink a toast to all our readers who put pen to paper (or fingers to keyboard) and sent off letters in support of our various campaigns – you have made a difference – Na zdrowie to you all! The cover page of the NIK report about the PKP group. (Click image to download the report (in Polish) from the NIK website. Poland’s Najwyzsza Izba Kontroli (NIK, the National Audit Office) has published a damning report about the management of the PKP group. Following a suggestion from the Parliamentary Infrastructure Committee, NIK decided to examine the way PKP SA, its eight largest subsidiary companies, and the Ministry of Infrastructure, have managed the assets of PKP. The period investigated was 2007 to the 1st quarter 2009. The financial performance of the PKP SA and the subsidiary companies worsened during the audited period. The financial reporting and internal auditing processes meet their targets and are reliable. and PKP and the subsidiary companies have maintained an honest approach with respect to their borrowings. The long-term debt of PKP S.A. fell from 10,034.3m PLN (2001) to 3,318.1 PLN (2008). During the same period the long-term debt of the subsidiaries rose fourfold. Short-term debt at the end of the Q.1 2008 stood at 2.833m PLN, of which 1,185m PLN was due to the infrastructure company PKP PLK SA – 567m PLN of this being overdue. PKP SA performs well in servicing its current debt obligations and the emission of new securities. It has been unnecessary to ask the State Treasury to repay these. (The Treasury guarantees PKP’s debts to the tune of approximately 5,000,000 m PLN.) However, NIK has felt it necessary to warn that the payments of some 2,695 m PLN due in 2010 – 2011 may be at risk if forecast income levels are not met, including income from the sale of PKP Intercity or the disposal of real estate. 233 properties (estimated value 62m PLN) which were surplus to requirements, and where the land registry formalities were complete were not offered for sale in 2007, as well as 180 similar properties (value 164m PLN) were not offered for sale in 2008. Of the 129.3m PLN of targeted income from the sale of shares, or privatisation of its companies, only 11.8% was actually achieved. The public issue of shares has been repeatedly postponed. The transfer of land and assets due to its subsidiary companies has not been carried out. In spite of the fact that, as of 31 March 2009, the land registry formalities had been completed for 71.3% of of real estate, comprising railway lines, none of this land had been transferred to PKP PLK . Only 0.02% of the land due to PKP Cargo had been transferred and only 0.25% to PKP Intercity. The remaining land was the subject of leasing agreements. In 2007, PKP PLK had 2,279m PLN available for modernisation and refurbishment projects, 2,090m PLN (91.7%) was actually spent. In 2008, 3,341 was available, only 2,502m PLN (74%) was spent. 35 projects had been prioritised in the EU-funded Infrastructure and Environment Operating Programme, but by the end of the control period PKP PLK had submitted the paperwork for just one project. In 2007, PKP SA had 124,6m PLN available for such projects, but only 78% was spent. This figure falls to 63% if Schengen projects are disregarded. In 2008, only 33% was spent of the 77.3m PLN that was available. Overseeing and ensuring the transfer of real estate from PKP SA necessary for the PKP subsidiaries to carry out their statutory duties. The additional leasing costs incurred by the subsidiaries are estimated to be not less than 660m PLN. In addition, notwithstanding that 9 years have passed since the passage of the relevant legislation through the Sejm, Ministers have failed to create the conditions which would enable PKP SA to carry out this transfer. Guaranteeing a stable basis for calculating track access charges. Yearly changes to the formula used to charge train operating companies destroys the possibility of any rational planning of train services or developing a long-term strategy with respect to customers. The lack of regulation, necessary to establish track access charges for the long-term, such that the competitive position of rail transport could be maintained, could be a serious barrier to privatisation. Currently track access charges comprise some 25% of the train operating companies costs. Preparing a framework for the way in which the infrastructure management body would operate. This framework has not been prepared notwithstanding that two years have passed since A strategy for railway transport until 2013 was adopted (envisaging the removal of PKP PLK from the PKP group) and 9 years have passed since the passage of the commercialisation Act. Up to the present time PKP PLK does not enjoy the legal rights of ownership of railway track. Moreover, as a result of having the status of a user (on the basis of charged usage) it cannot fully carry out its duties as infrastructure manager as laid down in the Railway Transport Act of 28 March 2003. The negative effect of financial irregularities uncovered during the audit process amounts to 1,140.8m PLN, and the the positive effect amounted to 3.5 thousand PLN. SM03-265 this morning outside Poznan Shed. Photo Marek Ciesielski. Last Saturday, as my osobowy to Ostrow Wielkopolski pulled out of Poznan, I spotted what I took to be a narrow gauge diesel on a well wagon. I phoned Marek Ciesielski who frequently travels between Wolsztyn and Poznan by rail and Marek kindly took the above photograph. 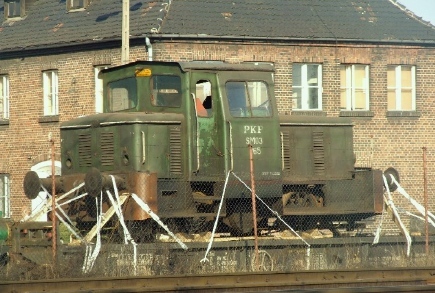 It turns out not to be a narrow gauge loco after all, but a small diesel shunter, one of 7 SM03s that were stationed in Poznan. The SM03s were called kaczki (ducks) because of their waddling motion along the track. 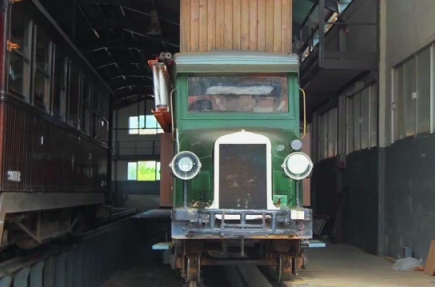 This loco is all set to go somewhere, but what an extraordinary lash-up. Surely this is not the proper way to restrain a loco when carrying it on board a truck? Your photos could keep Polish n.g. running! KOLEJTV is a tightly-edited and highly professional webcast produced each week by a small independent team of Polish rail transport proponents. The programmes are anchored by Dagmara Kowalska, who will no doubt one day follow the footsteps of Rocketboom’s first presenter, Amanda Congdon, and become a major media personality in her own right. KOLEJTV viewers have started sending in their own railway photographs and the programme’s web site features a small gallery of exceptional pictures. Each weekly instalment also features a brief photomontage chosen from a portfolio of photographs sent in by a viewer. This week’s programme features a set of pictures sent in by Krzystof Wajrach of the railway and tramway depot in Soller on Majorca. Ms Kowalska has invited viewers to send in more photographs of exotic narrow gauge railways. So we would exhort our own readers to do just that. While photographs of Dolgoch on the Talyllyn, or Beyer Garratts on the WHR might not seem very exotic to many of our readers, rest assured that they are exotic indeed in Poland. KOLEJTV enjoys access to the top people whose decision effect the running of Poland’s railways. Presumably some of them even watch the show. Your pictures might persuade some of them that Poland’s surviving narrow gauge railways have a future and should not all be turned into cycle paths! The address to e-mail your photographs to is: redakcja@kolejtv.pl Please put ‘Waskotorowka’ in the subject line.